I receive several requests every month for a Tzatziki sauce recipe, so I finally decided to oblige and provide my own take on the famous condiment. Creating a recipe video is always a learning experience. This is my first cameo appearance in an instructional Greek cooking video (I have to admit, I was a little nervous), so there is much room for improvement from a presentational, technical, and production value standpoint. On the other hand, I believe my recipe for a classic Tzatziki sauce leaves very little room for improvement, as the result is simply excellent - even if I do say so myself. Rich and creamy, with a bold garlicky flavour mingled with the freshness of the cucumber and dill, this sauce (or dip, or salad) will have you, your family, friends, and guests coming back for more. Just make sure to refrigerate it well before serving as the flavours need some time to coalesce in order to impart the full gustatory sense of this "salad" that eats like a sauce. Let me just say that I likely could have edited this video until the cows came home (figuratively speaking of course, as we don't have a dairy farm), but I am happy with the recipe itself, so I decided to publish it as is. My one solace: I am quite certain that after watching this Greek recipe video, you will not easily forget how to make a great Tzatziki sauce, it really is easy. So, enjoy it in good health! The quince and the Greek honey melded into a translucent paste delight, freckled with slivered blanched almonds. Click to Enlarge Image. 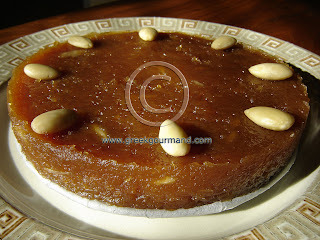 This Greek dessert is a specialty of the island of Kefalonia. Long before chocolates and other modern sugar-based confections appeared on the scene in Greece, Greeks were fond of this autumn harvest sweet; one used to be able to find it everywhere from bakeries to street kiosks, wrapped in quaint little folded parchment paper packets. Alas, times have changed and it is no longer so widely available. If you do find it, it is usually made with sugar as using honey exclusively would make it prohibitively expensive to sell competitively in the agorá. But believe you me; one can taste the difference in the finished product. The sugar-based versions are far too sweet for my palate. Greek honey is world renowned for its quality, flavours, and therapeutic benefits. Indeed, honey is a universal medicine in Greek households. As far back as I can remember, some thymarisio meli (thyme-honey) mixed with fresh lemon juice was a cure for symptoms ranging from the sniffles to full-blown bouts of congestion and coughing that accompany the common cold. My father even prescribed it as a preventative measure in the winter months. As a child, I had my daily dose before breakfast every wintry morning and liked it! My father used to tell me it would make me smart and strong, so I looked forward to each day’s spoonful, plus, it tasted good. Did it work? Well, let me just say that I did not come down with common seasonal ailments as often as most of my non-Greek friends; but when I did, I was not down for long. I say non-Greek friends because the other Greek kids (and there were many, as I grew up in a Greek ghetto here in Toronto) were likely undergoing the same regimen at home themselves. When done properly, the dessert achieves a translucent yet dense gelatin-like consistency. It is served in slices and can be garnished with crumbled pistachio or other nuts. Of course, you can serve it simply on its own which is just how I like it, along with a cup of tsaï faskómilo (“wild sage tea”), or as it is more commonly known: Greek mountain tea. Unfortunately, I will not be sharing the recipe for this amazing dessert today; I offer it only as a subject for reflection. After all, my blog is entitled Greek Food Recipes and Reflections. The recipe was a gift to me from a Kefalonian friend who has since passed on, yet her memory will endure in my heart forever. Who knows? Perhaps I will put it into a recipe book or something sometime in the future. Stay tuned. In the meantime, there are lots of other great traditional Greek food recipes on my blog for you to try, so have at it! P.S. One thing I will say is that upon trying her first piece of this dessert, my wife, Sophia, urged me to turn the remaining fresh quince into more of this... I resisted, but half-heartedly. A Stifado is essentially a savoury onion-based stew with meat and is an excellent comfort Greek food for those of us who are anticipating the winter doldrums. One can use rabbit, chicken, lamb, pork, beef or veal in this quintessentially Greek dish. Stifado can even be made with deer and moosemeat. In this video recipe for a Beef Stifado, I use a Greek wine vinegar which can just as easily be substituted by a unique Greek red wine called Mavrodaphne (or Mavrodafni). Indeed, fellow food blogger Hank Shaw from Hunter Angler Gardener Cook swears by Mavrodaphne in hisStifado recipes, and I agree that it definitely adds another dimesion to the meal. But, for those of you who may have a hard time finding some Mavrodaphne, the wine vinegar will do just fine. For those of you who do happen to have some Mavrodaphne on hand, use it in roughly the same quantity as the vinegar in the video ( i.e. 2 or 3 tablespoons). As a side note, Mavrodaphne wine also makes an excellent accompaniment to chocolate-based sweets, so it can also be served as a dessert wine when not used in stews or the like. So there you have it, a classic Stifado recipe as my yiayia (grandmother) used to make it. This one pot meal is rustic Greek cooking in all its simple and tasty glory.